The first grist mill in Bethlehem was located at McGregory Hollow, now known as Bethlehem Hollow, with Stephen Houghton as proprietor. In 1868-69, the Waumbec steam saw-mill was erected on the Ammonoosuc River at Pierce Bridge, by the Waumbec Lumber Co. who operated until 1877. In 1880, it passed into the control of W. G. Mowry. This mill gave employment to thirty-five men who annually converted about 2,500,000 logs into various kinds of lumber. James E. Viall was superintendent. The Waumbec Mill Co. also had mills at Gale River. Other mills were M. C. Noyes’s saw-mill that gave employment to seven men and annually cut about 300,000 ft. of coarse lumber, 150.000 ft. of clapboards and 200,000 shingles; John Pierce, Jr.’s saw-mill built by him about 1847, and employing thirty-five men, and H. C. Libbey ‘s saw-mill built in 1877. This mill employed about forty men. John Pierce, Jr.’s mill was located at Bethlehem Junction or Pierce Bridge as it was then called. As Pierce was the first man to erect a mill at Pierce Bridge, the little settlement was named for him. Bartlett and Noyes owned a lumber mill at Bethlehem Hollow, and there was also a lumber mill at Alderbrook which was in operation until the lumber ran out. Besides the lumber mills, there was Cortes Bolles’s cider mill, built in 1884, and manufactured about three hundred and fifty barrels of cider per year; Charles A. Sinclair’s grist-mill built in 1844 and operated by Allen Peabody, and a potato starch factory located on the stream once known as Bean Brook near the residence of Harry Bishop on the Littleton road. Here the farmers took their “Long John” potatoes, so called because of their length and peculiar shape. On this same stream and near the same vicinity, there once existed a mill for grinding provender, a threshing machine run by water power, and a blacksmith shop. There was a chair factory located near the Maplewood where chairs were made by hand. A carding mill was located at Bethlehem Hollow. Here the farmers took their wool to be made into rolls, after which it was spun into yarn by the farmers’ wives. F. A. Haskell’s carriage shop was built by him in 1879. Aside from a general jobbing business, he made about twenty new vehicles per year. In 1859, John Sinclair operated a lumbering business at Gale River. His colony consisted of several dwelling houses, a schoolhouse, a store and the saw-mill. 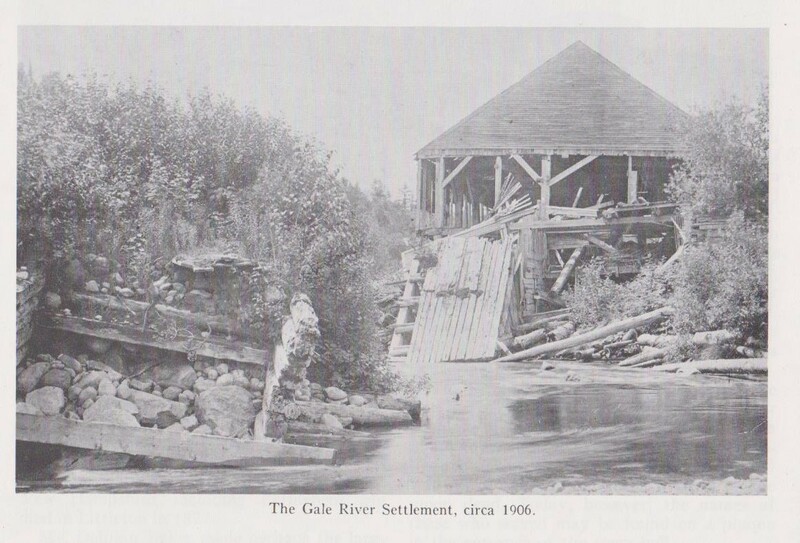 This settlement was called the Gale River Settlement. Men moved in here with their families while they cut and sawed logs for lumber. The old mill, the last of the buildings that once composed a thriving lumbering center, collapsed in 1906. It was at this settlement that the Scannell murder took place on Thanksgiving night in 1859. The mill closed down on Thanksgiving Day to enable the workers and their families to go out to neighboring towns for the holiday. It so happened that John Scannell and his wife and the Miller family who lived nearby were the only ones left in camp. That night feasting and celebration wound up in a drunken brawl among the two couples. Soon it was discovered that Mrs. Scannell had been murdered. This fact somewhat sobered the others and in desperation to blot out what had happened, they took the body and in the late hours of the night during a snowstorm, carried it to a spot known as the ox pasture and buried it in the deep snow. When the other families returned after the holiday was over and asked where Mrs. Scannell was, they were told that she had gone out for Thanksgiving and hadn’t returned. As time went on and she didn’t appear, they became suspicious and searching parties were sent out. It was not until one day in April when Allen Thompson and a man named Whitcomb, and two young boys, Asa Swasey and Jack Howland, went on a scouting trip through the ox pasture, that the body of Mrs. Scannell was discovered. The warm sun had melted away the snow and uncovered the body. The remains were taken to Bethlehem and prepared for burial. John Scannell and the Millers were arrested and several hearings were held by the court but from lack of evidence, they were all freed. John Scannell lived in Bethlehem many years after this incident and married again. This marriage, however, was of short duration, for the second wife left him after she heard of the Gale River tragedy. She worked out at different places in Bethlehem, one of which was Turner’s Tavern. John died at the County Farm.